Create urgency, generate interest, and boost your reservations with coupons, special deals, and social promotions. Want to boost your reputation and reward your guests? Our promotion engine helps you generate buzz and interest – both of which will drive up bookings. Whether it’s an early or last minute booking, for a long or short stay, HotelRunner makes every marketing campaign possible. Discount coupon codes can be configured for either a flat value (i.e. $20 off), or for a given percentage (i.e. 20% off). You assign the dates and terms of the discount – specifically the dates that a coupon is valid, the minimum required to earn a discount, and the types of properties the discount can be applied. Once a guest books a room, create an incentive for them to share their upcoming trip on Facebook and Twitter – without leaving the purchase funnel and your website. Reward your fans who shares their reservation information on social media using social promotions, and engage their friends to turn them into future guests. 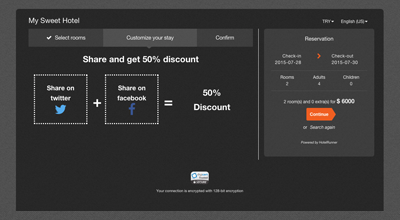 HotelRunner offers detailed usage reports that help keep track of your activity. We help you keep track of the discounts you’ve created, how those discounts are used, and the sales generated as a result of your campaign.